Tomato Torrent is the lightest BitTorrent network client that you will be able to find. If you use this P2P protocol, you will surely like it due to the little resources that it uses and the fact that its interface is hardly intrusive at all. 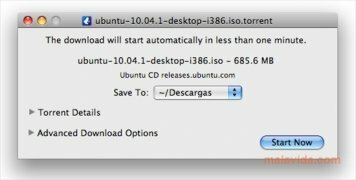 If you're tired of programs with interfaces that offer excessive information and you only want to download free files, install Tomato Torrent on your Mac. - Completely compatible with all the latest versions of the P2P BitTorrent protocol. - Remembers the latest downloads. - Allows you to configure until when we want to share downloaded files. - Universal binary (compatible with PowerPC). - Allows the configuration of practically any function. The truth is that using this P2P software to download free films and programs is very easy. Its interface is more similar to that of an assistant than that of a typical download manager, which makes Tomato Torrent a very recommendable options if we want to start in the BitTorrent world on a Mac. This download requires Mac OS X 10.4 or above.